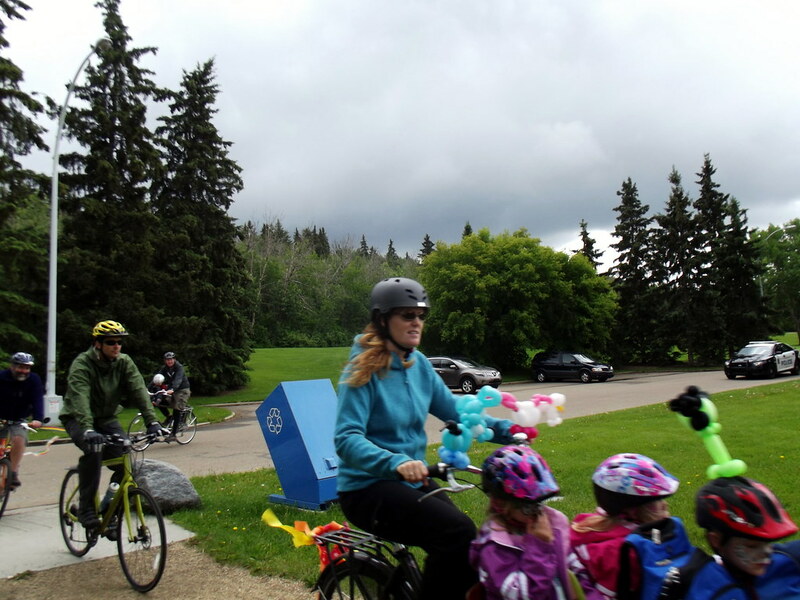 Considering that we woke to a downpour that morning, and we were competing with Fathers’ Day for peoples’ time, we think the first Edmonton Kidical Mass was a roaring success! We had bubbles and sidewalk chalk, which were a big hit with our littlest attendees. Pedalheads’ booth had information about the bicycle camps they run for kids from preschoolers through to teens, and had some prize giveaways. The craft table was stocked with star shaped cardboard and foam, washable glitter glue, and sequins, with the intent that they could be used as spoke cards. Mostly they didn’t dry in time to be used, and I suspect wouldn’t stay in spokes without an assist from some tape. 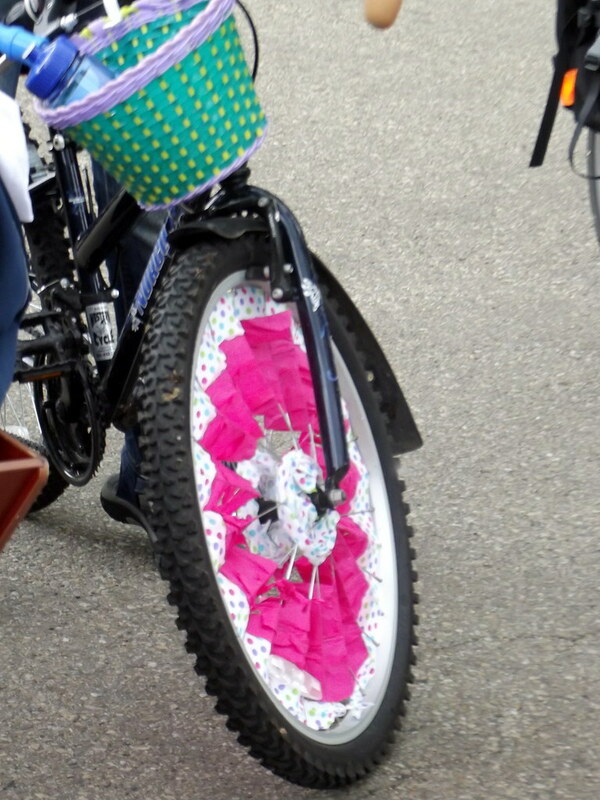 Some of the older kids created elaborate bicycle decorations with the supplied crepe paper ribbon while waiting for everyone to have faces painted and balloons made. Janice from Wonderstuff making magic with her paintbrush. 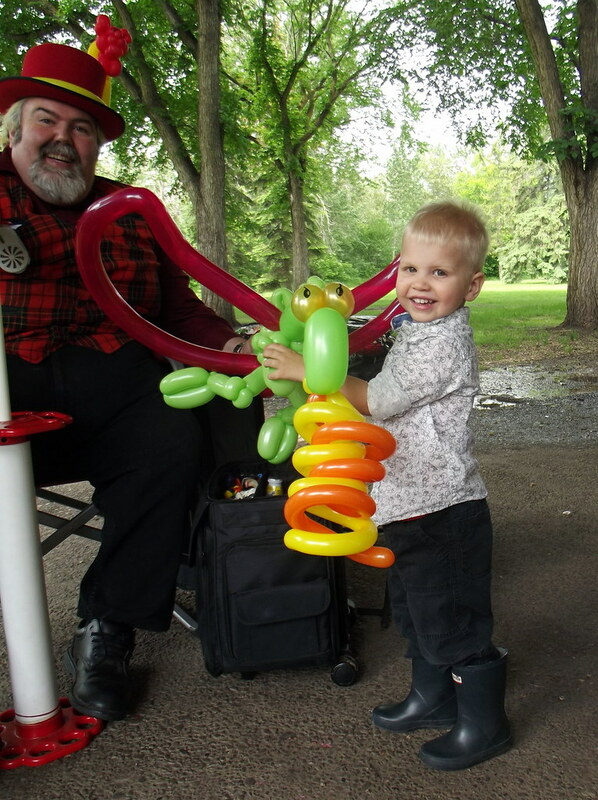 Matching face-paint and balloon animal. Cool! Elaborate balloon art on Erin’s helmet. It was fascinating to watch him at work. 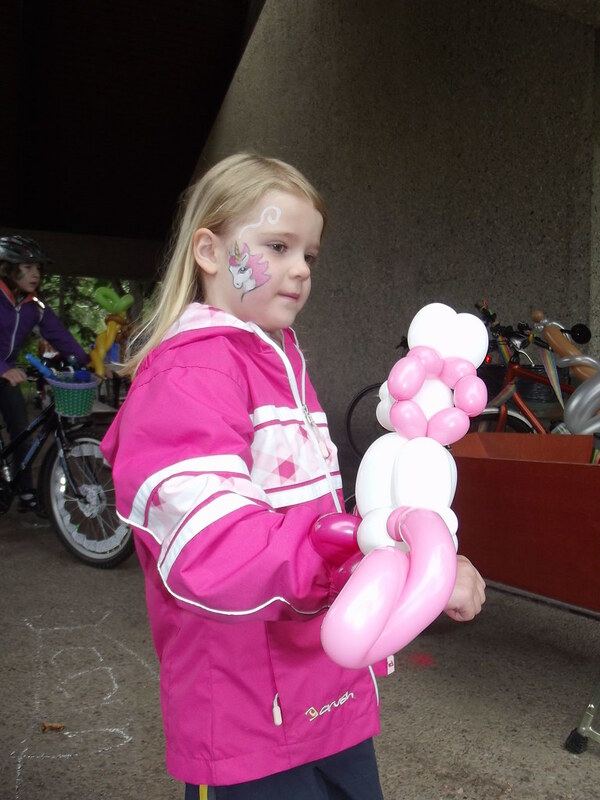 Big thanks to all the families who joined us for part or all of the event, Wonderstuff for the fabulous face painting and incredible balloon art, our guests Pedalheads (the bike camp people, not the local LBS) for the safety talk before the ride, and our sponsors at Bikeology! Thanks also to local radio station NOW fm and the Danone people who unexpectedly dropped by our picnic site with tunes and treats. Signal demonstration before the ride. Helmet fitting check, led by the rep from Pedalheads. And we’re off! We rode around the park to the playground. This shot was taken over my shoulder and you can see my helmet balloons in a corner of the frame. Pulling in to the playground area at the other side of the park. 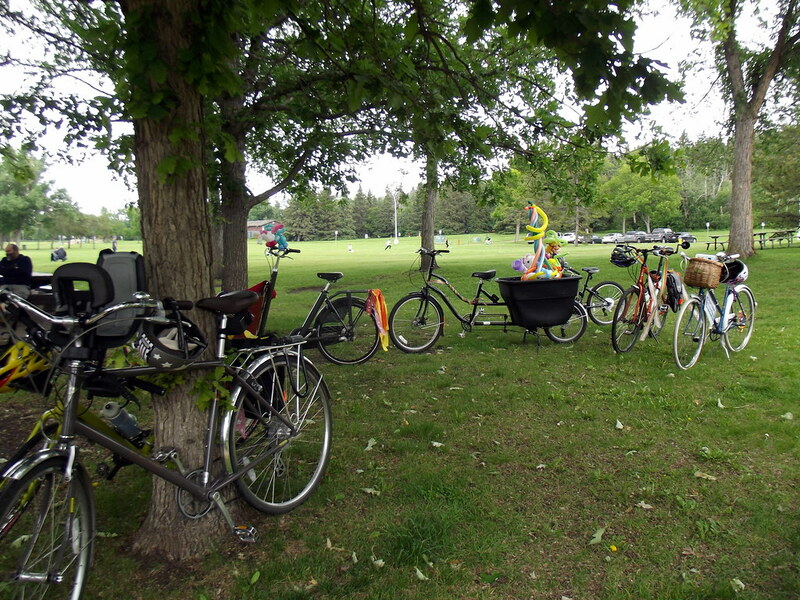 The grownups’ bikes at rest beside the playground. (You can see my huge balloon hat in the bucket of the Madsen.) Unfortunately none of my playground photos turned out, so you’ll just have to take my word for it that the kids had fun and we stayed longer than intended. 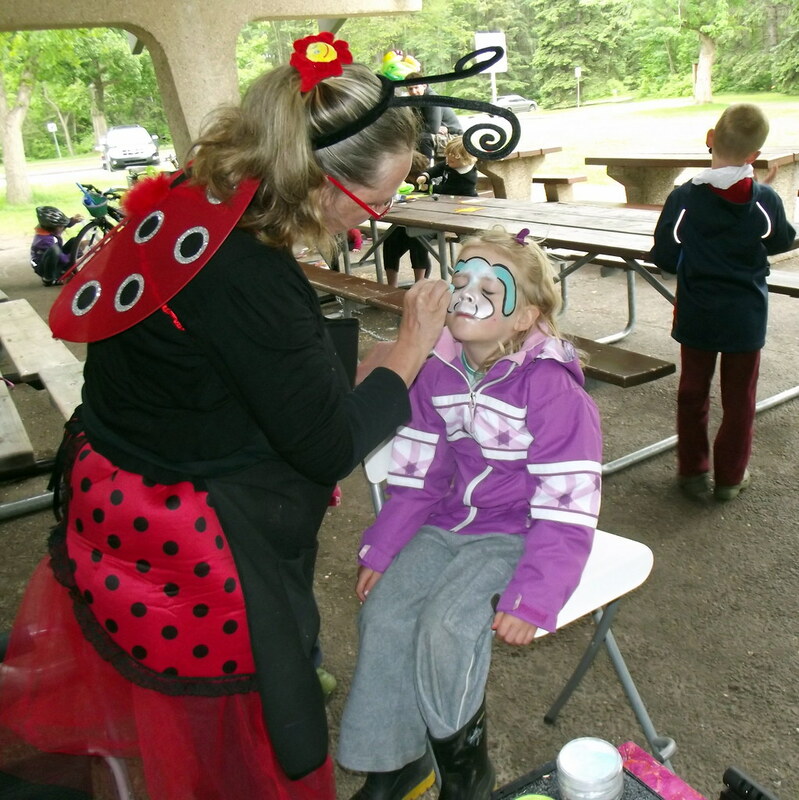 – Face painting and balloons take time to do well, so we ended up only having time for a single loop around the park, instead of two or three as originally planned. Playground stops with small children also always take longer than you think they will. – Balloon decorations on helmets look fabulous in photos, but even the slightest breeze will make the decorated helmets very uncomfortable to wear. 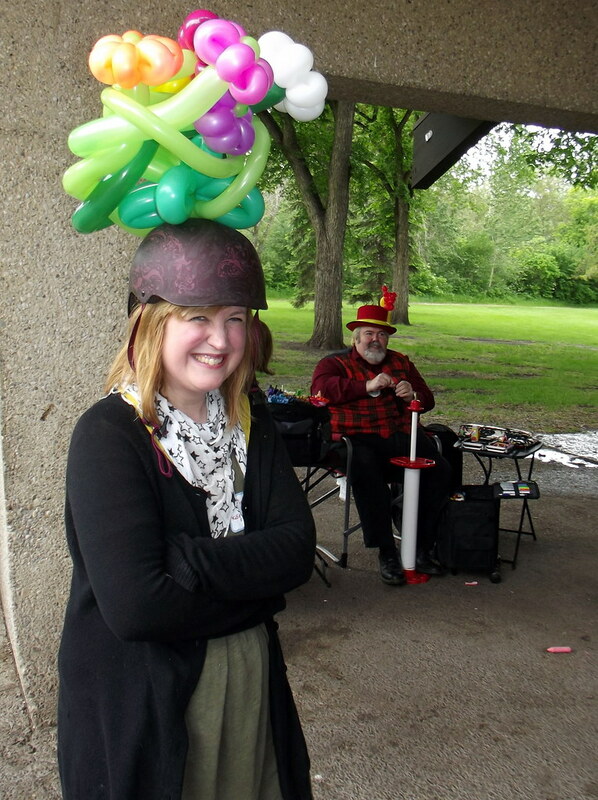 My tall balloon hat actually moved the helmet around a lot on my head, which was distracting and felt unsafe. Balloon art that strapped to handlebars or wrists worked great, though. – Kids on balance bikes or training wheels travel at speeds low enough that some cargo bikes will feel unstable and need to pass, so choose which adult will act as the sweep accordingly. – We heard from a few attendees that they knew families who had not been able to come because they didn’t have the time to ride to the event, or a vehicle that allows them to transport their cargo bikes or kid-haulers across town. Of course organizers in other cities have had the same issue. Our solution will be to move the ride around the city, and so we have created an Edmonton Kidical Mass page on Facebook where we can run polls to figure out which neighborhoods to visit next. Please join the conversation there! Our next family ride will be in September or October. – There is now a company in Montreal who are importing bakfietsen and other Dutch bicycles to Canada, and that’s how Karen and Mike came by their beautiful bakfiets. It’s fitted with two seats, so all three kids (ages 5, 5, and 7) (or, as Mike pointed out, one tipsy adult) can ride in the box. Sometimes the eldest child gets out and helps his Mom push it up the river valley hills, but otherwise they find it well suited to Edmonton’s terrain. PS: we are trying something new by posting all the photos on Flikr (you can see the whole set here), then adding images to the posts using the URL. Let me know in the comments how that works, ok? Thanks to all who came out, despite the drizzle, for yesterday’s Critical Lass ride! Here are a few candid shots I took at the beginning of the ride. Sorry, no group photos this time. Karen is 6 days to her due date in this photo, and still riding her Linus comfortably, although hills are a challenge. In awe. My kids rode their Norco bikes, and Erin hauled her littles in a Madsen borrowed from Karen’s. She said the balance felt a little different than her longtail, but it felt like they were about the same weight and effort to pedal. It was chilly, so both Erin and I had opted for wool layers in our outfits. I love that the Madsen has a frame lock – so smart for something that’s hard to maneuver into a bicycle rack. My jacket is in the basket and didn’t stay off for long. I wore a wool-and-angora-blend tunic, bamboo-blend skirt, leggings, and the wonderfully loud bicycling socks from RedBike (not shown). You can see Karen’s gorgeous boots from local designers Poppy & Barley in this shot. Layers and denim were the outfit of choice for the breezy, drizzly conditions. My husband was out of town, so we chose a short, level route in the neighborhoods surrounding the university – then cut it even shorter when my littlest on his single-speed kid bike had clearly had enough. Oh, parenting. At least my eldest was a trooper. I won’t repeat the experiment of bringing both kids along for another couple of years. I am so grateful that everyone was patient and wonderful with them. Bike people are the best. I promise next ride will be longer and more interesting, and there will be photos from en route! We ended up at Gracious Goods in Belgravia, where we took over a cozy corner of the cafe and had a lovely chat. The food was delicious. You can kind of see the menu overhead in this photo. Lots of lovely baked goods, soups, and sandwiches. Most of us opted for tea, but they have coffee from Transcend. I was also grateful that Karly and Anna, who have so many Bikeology events to attend as the Bikeology organizer and EBC board member and former executive director, made time to come ride with us. These women seriously rock my world. Then Karen, Erin and her kids, and me and my kids bailed and headed home. I hope the rest of the riders continued on and explored the neighborhood a bit. Thank goodness several of them had also attended the Vintage Ride organized by Raving Bike Fiend during the morning (I’ll update with links to those ride reports when they go live)! Hope to see you at Kidical Mass next Sunday! The Kidical Mass logo, via Totcycle. 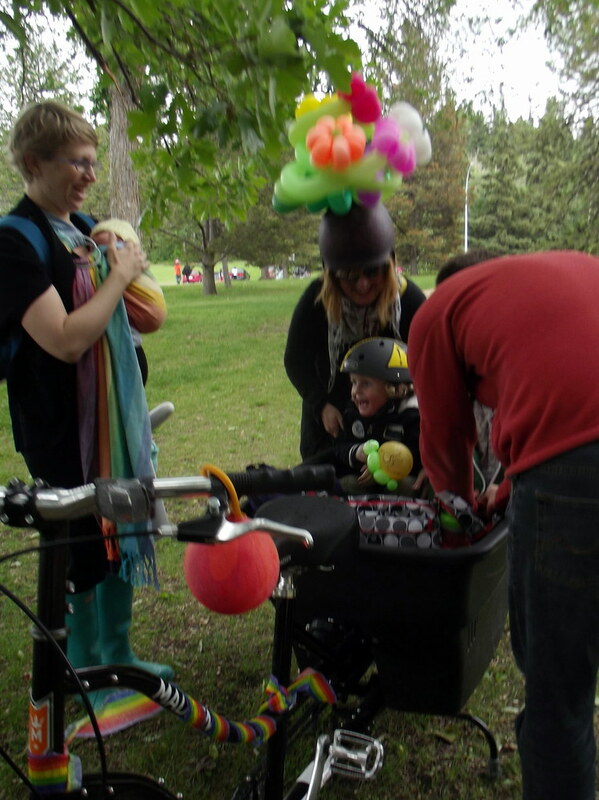 We’ve been talking among our circle about organizing a Kidical Mass ride in Edmonton for ages now, and decided that this is the year it’s going to happen! Our planning team includes me and Angel, and our friends Karen (who might not be able to come to this one since she’ll be caring for a newborn, but will be a regular in the future) and Erin (who has just moved here, and was an enthusiastic participant at Victoria’s Kidical Mass events). 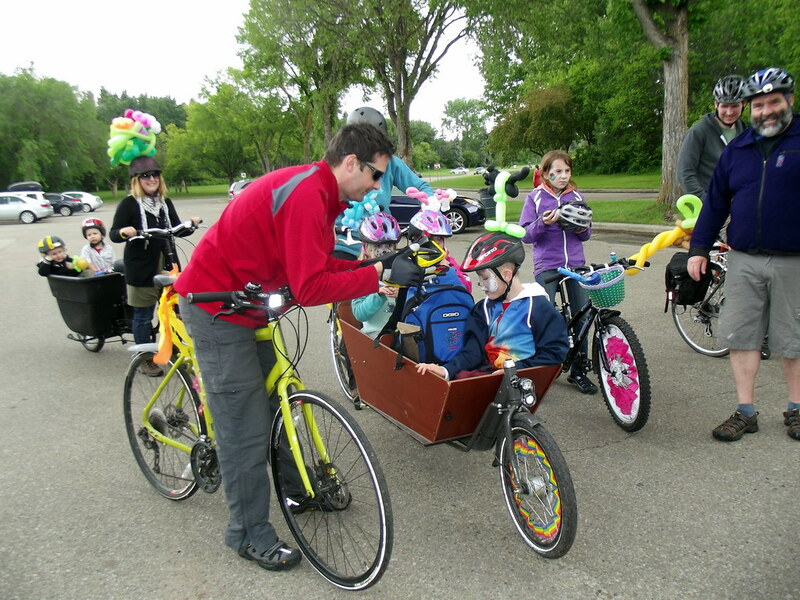 Kidical Mass is a lighthearted family- and kid-centred group ride that is now running in most North American cities. For more information, check out their About and FAQ pages. When: June is Bike Month in Edmonton, so it seems like the best time to hold our first one. Since the 3rd Sunday was clear of rides last year, we chose June 16th and checked with the Bikeology Festival organizers to ensure we wouldn’t be overlapping with any of their major events. They gave us the all-clear, and search engines gave us nothing to be worried about on the date, so: Sunday June 16th it will be! 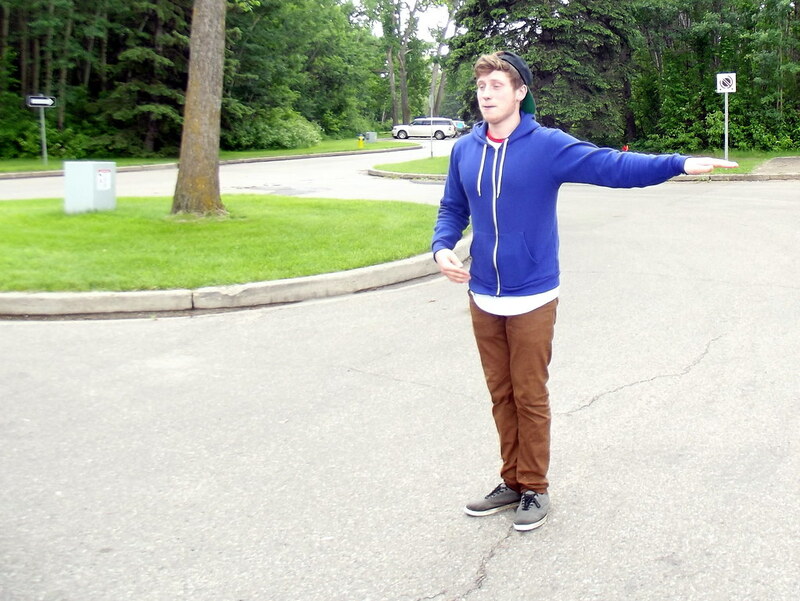 Where: We wanted a central location, so we chose Hawrelak Park. It’s nice and big, there are picnic facilities and a playground, any vehicular traffic moves at a speed slower than typical residential roads, and there are lots of unpaved bike trails if anyone wants to take their kids for a different sort of ride, in addition to the official KM ride. For anyone who needs to bring their bike quite a distance, there’s parking, and the ride there from the closest LRT station is pleasant (well, hilly, but pretty!) if you prefer to go multi-modal. Before we announced it, a couple of us met at Hawrelak to try out the route and do some brainstorming. Promotion: We will be promoting it on Twitter using the #yegbike hashtag, a Facebook event page the Bikeology festival organizers created, fliers made by our kids (see below), and getting our rides listed with the official KM page and the Bikeology Festival page (where all the fantastic local events during Bike Month are listed) and maybe a couple of the local parenting blogs (update: City and Baby kindly included us in their roundup of Fathers’ Day events!). A poster my daughter made, which we’re photocopying to post in a few key places. Food and Activities: We agreed that the best idea this time around is to keep it relatively simple. Bring your own picnic; we’ll provide some fresh fruit, bottled water, a lemonade stand, and peanut-and-tree-nut-free ice cream and popsicles. 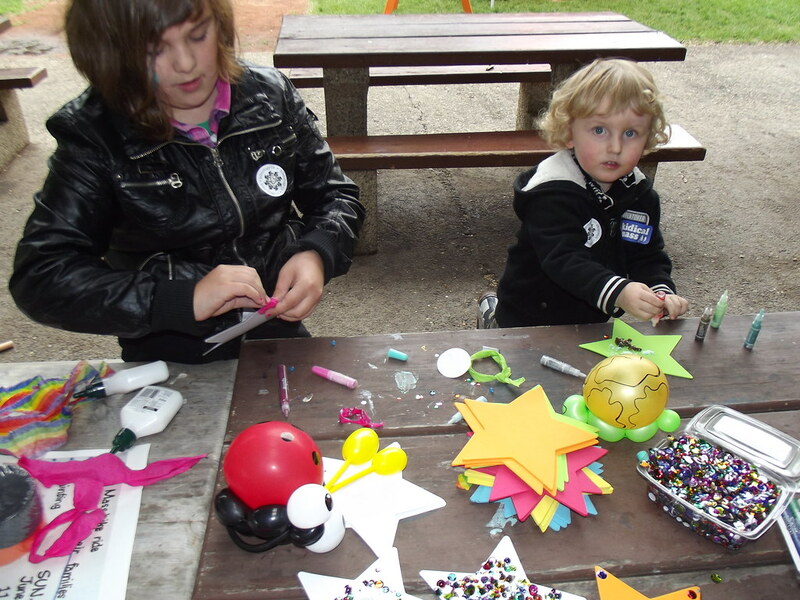 We will also have a craft table for making sparkly spoke cards, a bike decorating area, and face painting! Update: there will be face painting and balloons by Wonderstuff, and a booth by Pedalheads childrens’ bicycle camps. 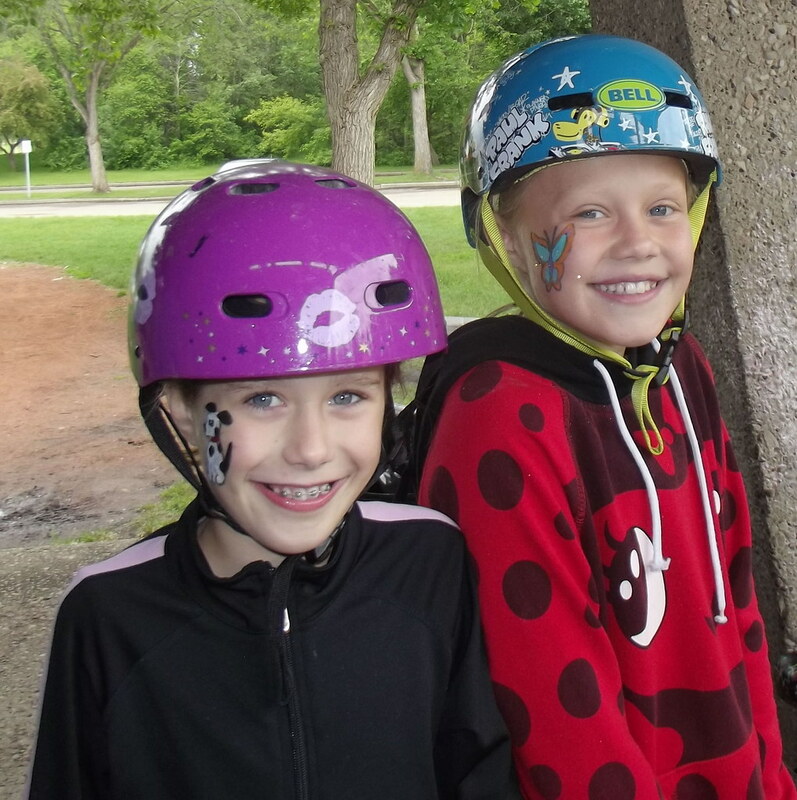 Safety Thoughts: For liability insurance purposes, all participants (not just children) are required to wear helmets, and we’ll go over how helmets should fit. We’ll also remind everyone how to do hand signals. We will assemble for the ride in the parking lot beside Picnic Site #1, which we will close to traffic while we’re getting ready. We will be riding on the road as a group, but traffic within the park is restricted to a 20 km/h speed limit, so it will be a very safe introduction to riding on the road. Our ride leader will keep our speed moderate, and our ride sweep will make sure nobody gets left behind; both will have signs and flags on their bikes and high-vis sashes. Other Housekeeping: Picnic Site #1 does have shelter and washrooms. We will doing the ride rain or shine. Need to find the organizers? We’ll be wearing high-vis sashes and balloon hats, and I’ll be the one in the polka-dot helmet. Followup: During the event, we will also do an informal survey of our attendees to gauge interest in a smaller monthly Kidical Mass ride and in an annual Fiets Of Parenthood event, and to get a sense of the proportions of new vs experienced cycling families in attendance. If we get enough interest, we will do a second family event in the fall, then might set a monthly schedule starting next spring. 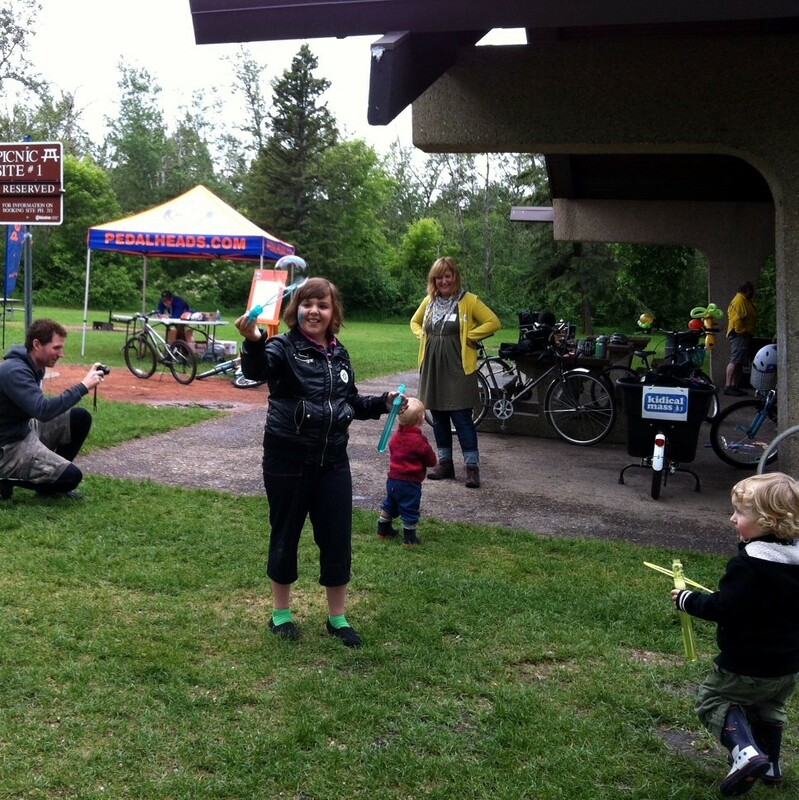 Want to organize a Kidical Mass in your community? Check the Kidical Mass site to see if one already exists, then read this how-to post from Simply Bike. Dom on his Norco ZX-80 at the end of March. During April, I spent a lot of time supervising my 7- and 9-year-olds as they rode up and down our cul-de-sac getting used to their new-to-them bikes from local not-quite-little bike shop United Cycle (they had both outgrown their previous rides). Dom (above) has a Norco ZX-80 steel-frame mountain bike. It has 20-inch wheels, a hand brake, and a rear coaster brake. Audrey (below) has a Norco Groove with 24-inch wheels, an 18-speed derailleur setup with twist shifters, and hand brakes. Both of them are now riding confidently enough that we can go for longer rides, and travel the mile to their school in about 10 minutes (depending on the timing of the lights where we cross the busy road). Audrey on her Norco Groove in mid-May. On April 9th, I did a 30 minute ride by myself to explore the other end of the multi-use path along the top of Whitemud Creek Ravine in my neighborhood, on Trudy Phillips. Had to do a snowbank portage around a crane that was installing windows in a house under construction, and the path was mostly largely wet and sandy, but it was just above zero and the sun was shining. I found a feather on the path, watched some crows and a raven about twice their size, and found a new secret entrance to the big field under the power lines beside the Henday. Trudy (’72 3-speed Phillips) on a dry part of the MUP. Much of the path looked more like this, wet and gritty. Also, long down winter jackets = I would have baked on a less windy day or a longer ride. If I do take up winter riding I need a layering re-think. Look what I found! We think it’s a great horned owl feather, since there are a few that live in the ravine. Don’t be jealous, just visit the Society of Three Speeds website to get your membership. Three speeds is all you need! By early May, the snow had melted, the snow mold had dried up, the paths had dried out (although they’re *still* covered in grit), and it was warm enough that the pussywillows were coming out and we could wear tank tops. May 5th. Audrey riding ahead of me on the MUP. As you can see, this goose was really close to the MUP and not at all afraid of the humans whizzing past. A week later it was 20C and glorious. I often joke that Edmonton gets only a week of spring, but this year it really was true. Green grass and warm sunshine, and the rod-brake DL-1 out of hibernation. Aaaah. Trudy, a 1972 Raleigh-built Phillips 3-speed, as found. Trudy, right after her upgrades. New tires & tubes, a big bell, a new saddle, a double kickstand, a front basket with a basket support, and a Bobike Junior+ professionally installed using the universal seat tube bracket. The only things added since this are a Hebie steering damper, which holds the front wheel in place to make the bike as stable as possible when parked while getting a child into or out of the seat, and Bobike’s saddle spring protector. Trudy, after her upgrades, after the first summer of use. Notice that the angle of the child seat has shifted a bit, with the seat post attachment up higher than in the previous photo. The clamp on the back of the seat was used to carry the insulated lunch bag, and can be used to help secure light loads when the seat is closed. For the last two years, we have been using a Bobike Junior+ child seat on the back of Trudy (a ’72 Phillips 3-speed) to carry my son Dominic on longer rides. It has worked wonderfully for us, allowed us to take longer rides we otherwise wouldn’t have been able to do, and Dom (ages 5 to 7) has been thrilled with it, but we don’t have many photos of it in use – when I’m riding with a passenger, I feel less able to take a panda shot, and it never occurred to me to ask my husband to take some photos. Closest we’ve gotten to a panda shot: our shadows while parked. A beauty shot of the Hebie steering damper, which is essentially there to stop the front wheel flopping around while you load and unload your kid. I ordered mine from Dutch Bike Bits. Hmm, the seat post attachment has definitely crept upward, and it looks like the back tire needs more air, too. Another reason for no photos: Dom hates having his picture taken. If we still needed the seat for Dom, I think we would have it re-installed on a lighter modern bicycle, to make it more secure and make it easier for me to get uphill. There’s a reason those Japanese mamachari come standard with pedal assist! It would also be preferable to install this on a bike that has skirtguards/coat protectors. Bobike sells these as part of the Maxi’s assembly, but not the Junior’s. This wouldn’t be a problem in the European market, but it’s more of a challenge here in North America. Dom has been conscientious, and I’ve always ridden slowly with him on board, but it’s too easy for a foot to slip off a footrest into the spokes. If we’d been able to find solid skirtguards to install on the 3-speed, we would have – but we couldn’t, and we felt that crocheted ones wouldn’t have provided enough of a barrier. My only other quibble with the Bobike seat has been that I couldn’t figure out how to carry anything on a rack underneath it, if I had been able to install a rack (which the geometry of my vintage bike plus the child seat forbade). That limited me to what could be carried in the front basket, a crossbody satchel, and a little lunch bag attached to the clamp – which meant, only little errands and no grocery runs for this bike. Hum has that issue all sussed out: Basil panniers on the rack of a newer bicycle are the answer! She discusses the options for both a regular bike and a mid-to-long-tail. So. I hope this review of my experience with the Junior+ child seat helps those of you who are weighing your options, and I hope it helps Miss Sarah figure out which bike it will go on for rides with her little guy. It’s a great seat that fills an important niche in family biking – the ability to carry an older kid on the back of a bike is a huge thing for expanding how often you can use your bike. But it’s not optimal for installation on a vintage bicycle. A modern bicycle that’s not so heavy, isn’t undergeared, and has an integral rack (for panniers) and skirtguards – like, you know, a standard-issue city bike from Europe – would be the ideal ride to install this on. In May, I went to San Francisco for a business trip. I booked a Sunday morning flight, so that I could have the afternoon free for fun. With great luck, I was able to join Hum of the City and her family to the Mission District Street Fair. We’d only “met” via twitter and blog comments before and it was a delight to meet her in person. Fun fact – we’re both in the medical sciences field, but had no idea until we met that day. “Hum” rode her honest-to-god Japanese Mamachari, which she’s posted on extensively. All I can add is that any bike shop that doesn’t think there is a market for ready-made family transportation bikes is in denial. Or doesn’t talk to parents. Seriously – every time she takes this bike out, people stop her to ask where they can get one. I want one – and my kid’s far too big for it. Her husband and son rode this fantastically designed trailer bike. It’s attached via a rear rack, making it super stable, just like our Burley Piccolo. However, it attaches at the very back, leaving the top of the rack available for cargo or a rear child seat. In contrast, the Piccolo has a giant knob in the middle of the rack, so the sides can be used for panniers, but a child seat cannot be attached. The downside? It’s only available in Germany. I need to start expanding my linkedin network to more international scientists, so that I have access to some of the cool bikes available overseas. I got to ride the Brompton – see how many cool bikes they have? I found the handling a little weird at first, but quickly got used to it. I’ve been admiring these baby-wheeled devices for well over a year now. I haven’t come up with a convincing rational for why I need to buy one yet, but it’s only a matter of time. Once we reached the Mission District, the party was in full swing and the streets were filled with people. People walking, people riding bikes – the atmosphere was incredibly mellow and happy. We did need to use our slow-biking skills to weave through the crowd. But hey – at this point we were already at our destination, so what’s the hurry? We traveled the whole length of the street fair, stopping to watch performances, including this cabaret/acrobatics group, and the obligatory bathroom & snacks stop. We were very sad when the party ended with a police sweep and a return to normal traffic. Yes, I have now joined the ranks of people who take pictures of infrastructure in their spare time. At least I didn’t run out into traffic to get a better shot. Our route home went along “The Wiggle”, which wins for the best named bike route EVAH. The city has recently replaced the original sharrows with the green version above. They’re bright and I love them. There is no way you could miss a turn marked with these babies. Last month, Seattle’s Greenwood neighborhood had their street fair. By a terrific coincidence, Hum of the City was here for a visit, staying with Family Ride! The family biking blogosphere can be such a small world some times. This time we were there at the very start of the street fair, which was a strangely gradual affair. “Oh look, they’ve closed off the street! Let’s go, kids! Whoops, there are still cars coming, get back to the side!” Fortunately, it wasn’t too long before the streets were really, truly closed to cars and the party began. Spencer did loops. And needs his seat raised. How did he grow so quickly? I was really happy to see Spencer and Theo have so much fun together. A lot of my Seattle bikey friends have younger kids, so he really enjoyed having a new friend his age. Despite the difference in height, Theo is 2 weeks older than Spencer. 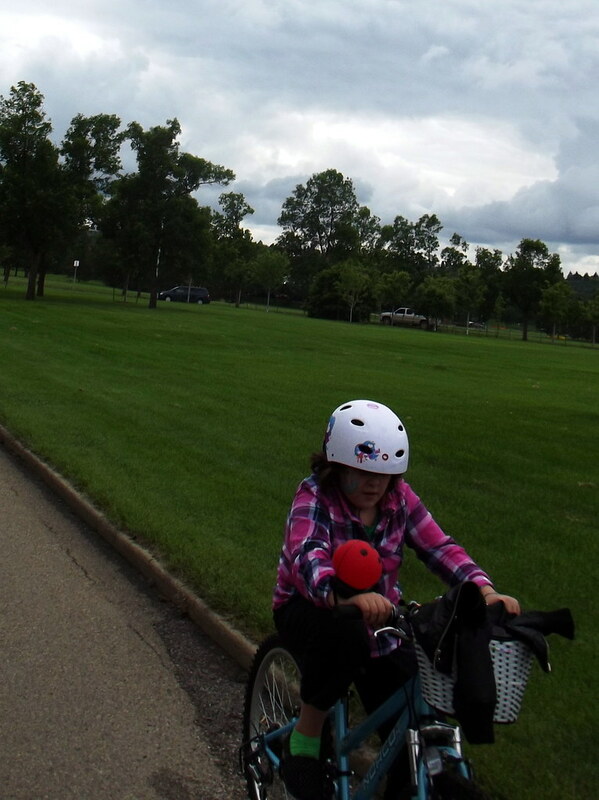 Family Ride, being lapped by a balance bike. The streets were full, but not quite as crowded as at the San Francisco Fair. We ran into a number of friends with whom we had to stop and chat. 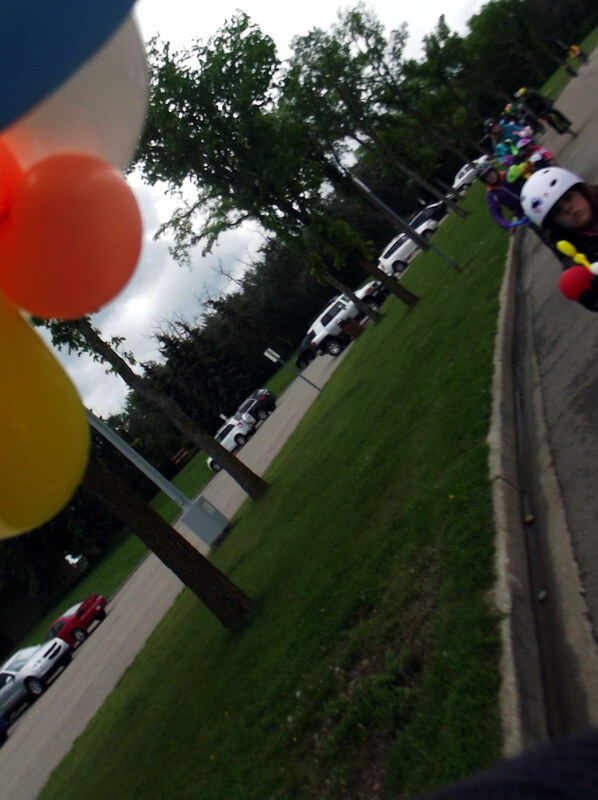 There was bike decorating, a (very) brief kids’ parade, and some fun performances, including a high rise trapeze act. My photo doesn’t do this justice – her act involved a lot of spinning around and was a lot of fun. A Hawaiian dance troupe put on a performance and let the boys try out the poi balls. The difference between poi and nunchuks is thin, particularly to 6 year old boys. Oh well, at least they were wearing helmets. Alway dance in helmets, folks – think of your brains! After a lot of street partying, we were all getting hungry. There really weren’t any street vendors, so we locked our bikes and helmets into an impressive pile and tried to get a table at a nearby restaurant. Alas the wait was long and our party was large, containing many children, so it was not to be. We had to say our goodbyes and get home before dark. It was so much fun to be out and having fun in the street and meeting friends, new and old! This is an X-wing starfighter pancake, with laser blasters. Parents who bike with their kids will often talk about how connected they feel when riding together, compared to when they are in a car. This can, of course, have a downside – one of my friends swears that her son waits until she’s riding uphill before asking her for something. Perhaps on the theory that if she doesn’t say no (due to being short of breath), the answer is yes? Of course, they live in San Francisco, so they’re riding uphill about 50% of the time, creating plenty of opportunity for a hopeful 6 year old. Many of our conversations revolve around Star Wars these days…. S: Mom, what’s your favorite thing about R2D2? Isn’t he so cool? ‘Cause he has rocket boosters! Can you sing the Darth Vader song at the same time I sing Luke Skywalker’s song? Sometime conversations start innocently and then take a much weirder turn. S: Mom, what’s a club? Me: A group of people who get together to do something, like your karate club. S: Can I start a club? Me: Well, I guess. If some of your friends want to be in the club with you. S: I want a nerf gun club! Can I get one of the guns that shine a red light to help you aim? Me: No! You can’t start a kindergarten gun club! S: Well…can I have one that shoots water? Other times, it’s surprisingly philosophical. Me: I don’t understand. Why would you expect to see a line there? S: Well… I have two eyes. Why isn’t there a line in the middle of where I see? Me: Oh, I get it! Well, your eyes are close together and see mostly the same thing. Then your brain puts the pictures together so you see it all at once. S: How does your brain do that? Me: Can’t talk. Pedaling. Uphill. S: Is Obama still trying to make things more fair so that girls don’t just have to marry boys and boys don’t just have to marry girls? That’s not fair! Me: You’re right. Obama and a lot of other people are working together to try to make things more fair, so people can marry whoever they fall in love with. S: Oh. Can I have a granola bar? Me: No. We’re going to have supper as soon as we get home. At this time of year, Seattlites are like flowers in the desert. Growing up in Saskatchewan, I would have scoffed at Seattle’s winters. When the ground is covered in snow and ice and the most important part of the weather forecast is the windchill factor (i.e. how many minutes before exposed skin WILL FREEZE), grey skies with rain doesn’t sound that bad. This is why TROC* considers life in Vancouver to be pretty easy, the kind of place you go to retire. In January, I can’t complain about 40F/4C and I won’t pretend to. Where Seattle gets under your skin, is that over the next several months, those temperatures won’t change. By April, it would be really nice to see blue skies and to start feeling warm again. Two weeks ago, we finally had nice weather on a Saturday. Seattle opened the front door and rushed outside, trying to fit as many outdoor activities as possible into a single day, just like the proverbial plant in the desert that, after a rainfall, must flower, bear fruit and go to seed before the water disappears. First on the list was tee ball practice. It’s much more fun to get there by bike, especially when you have a shiny new family bike to ride. Carrying a ball glove and cleats is no problem if you have panniers! Then, we rode to the Fremont neighborhood for food, shopping and a chance to walk in the sun. Mr. Jen isn’t very comfortable on a bike. I read a brilliant description of this mismatch as a bike-car interfaith marriage. However, he does like to walk a lot, so friends, whom I consider to be authorities on such matters, have classified this as more of a Catholic/Episcopalian difference. Joking aside, he was willing to walk the 4 miles to meet us. Fremont is always fun, especially if you don’t have to park a car. We ate Thai food, window shopped, and stopping at Hub and Bespoke, who have very stylish bicycle-friendly clothes and accessories. I tested my families patience by trying on clothes. They tested the employee’s patience by trying out bike bells and wind-up toys. And then there was Pie. It was delicious. You should go. We will be back. On our way home, we stopped to admire the shrubbery dinosaur. I never know how to end these posts, so I’ll keep it simple – it was sunny, it was fun and I hope the weather cooperates so we can do it again soon. *The Rest of Canada (i.e. not Vancouver. Or Victoria. We’re suspicious of them too). As I posted before, we’ve been looking for a new family bike. I do want to start teaching my son to ride independently, but, given the traffic and hills in Seattle, we’ll still need a family bike for a couple of years, if not more. There appear to be 3 options: another trailer bike, a cargo bike, or a tandem. I did think about a cargo bike. I know folks who have Madsens and Xtracycles – come to think of it, one fellow has both a Madsen and an Xtracycle. They’re very cool, but Spencer’s very tall for his age and I suspect that he would outgrow the passenger stage before long. Plus I like having a co-pedaler. When I was discussing the options with my family and mentioned the Xtracycle, Spencer said “No, I like pedaling!” Then he paused, thought about it a little more, and looked at me with big eyes and a little grin. “Mommy, do you want a challenge? You should get a bike where I don’t pedal – and then ride it up a really big hill!” No way is that guy getting out of pedaling now. Then there’s the tandem – I have to admit, I was a little baffled by the options. How do they accommodate a growing kid? I don’t really want to buy one that we would have to replace in a couple of years. None of the shops nearby seemed to know anything about tandems for kids. So, without some ready examples, it seemed too complicated and I was impatient to get us back on the road. What are the trailer-bike options? Well, I definitely didn’t want another Adams. Even if I got a post-recall hitch as a replacement, I’d still feel uneasy with it. Plus, the side-to-side wobble has always been annoying. One option that looked really cool is the FollowMe Tandem. It’s a device that attaches a kid bike to an adult bike, lifting up the front tire. This has the great advantage of being able to ride together to the park and separating the bikes so that the kid can ride independently. However, they’re not carried by any stores in Seattle – in fact, Clever Cycles in Portland is the only distributor in North America that I could find. I do plan to make the trip before long, but really wanted to check one out in person first. Bring in the cavalry! Madi of Family Ride, who has amazing bike sense, found a local FollowMe owner and got her email. After check it out, I was impressed. It seems to be very well made and it felt solid as a rock. Despite the steep price tag (about $400), I thought this was the way to go. Plus, I would surely be able to sell it to local bikey people when Spencer out grew it. Lots of them have kids younger than mine. So, after carefully constructing my rationalizations for a week, I called Clever Cycles – who are sold out of the FollowMe and don’t expect to get more for months. Sigh. I picked my broken heart up off of the floor and moved on. The next choice also was by way of Madi, who found and tweeted about a used Burley Piccolo at Recycled Cycles (have I mentioned that she has amazing bike sense? She’s like Spider-Man for bicycles). 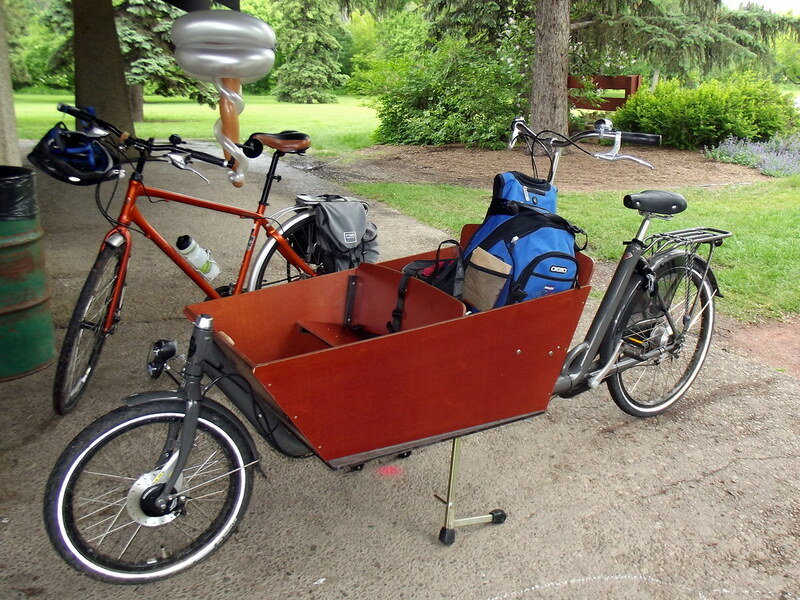 The Piccolo is a trailer bike, but it connects to the parent bike by a special rear rack, rather than at the seat post, which is more secure, according to the reviews. After checking it out and liking what I saw, I decided to get it. We’ve been riding the Piccolo for about a month now and are really happy with it. Our trips have been around the neighborhood, probably 4 miles at the longest. The connection to the rear rack does indeed feel very strong and secure. In addition to the locking post, there is a bar underneath that should prevent and accidental separation. I’m also very pleased to find the ride to be more stable, without the side to side wobble. It’s still not as solid as a single piece bike like an Xtracycle, but it’s a noticeable improvement over the Adams. A darn strong connection via the rear rack. The handlebars can be adjusted up and down, which is a real advantage for us and I expect to get at least 2 years out of it. It also has 7 gears. This delights Spencer and I now hear a continual chatter about what gear he’s using, and 7th gear is the best, because it has the most power, right Mommy? He’s actually right! I was surprised at how much more of a boost he can give me with this bike vs. the Adams. Now, if I can only get him to apply this power when we’re going up the hill, rather than down. Little speed demon. Some reviewers have complained that their panniers don’t fit. I can see how this could be a problem, as the tubing pinches in at the middle, leaving very little clear space for pannier attachments. Luckily, the hooks on my Ortliebs can slide back and forth, so I could adjust them to fit. Keeping my cargo capacity is VERY valuable. Apparently the new model has an additional straight bar along each side, so they should be compatible with a wider variety of panniers. All in all, I’m pleased with the Piccolo. Aside from our mechanical issues with the Adams, the Piccolo handles better as it’s is less prone to squirreliness at low speeds and less affected by the kid’s motions. It looks like it will accommodate a taller kid, which should give us more time with it. The gears are definitely entertaining and potentially even useful. Now, I can’t wait to take it out on longer rides! The 6 year old urban planner. Part 3. During our downtown adventure of a couple of weeks ago, my son and I came to the intersection of 1st Ave and Cherry St. As we were waiting at the corner, I explained that it was an all-way-walk signal and that when it changed, we could cross in any direction, even diagonally.